I get a lot of questions about the products and projects on this site. 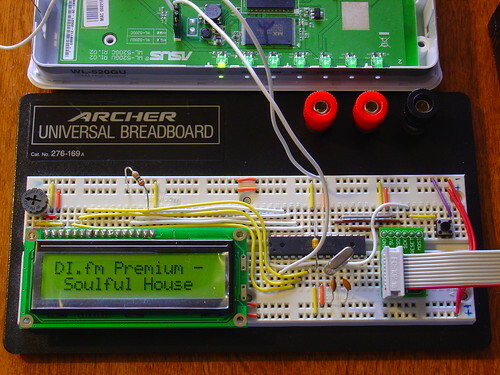 This is great, because it means that people are actually buying kits and reading the blog! Unfortunately, answering these questions takes a lot of time. What is particularly time consuming is that I often answer the same questions over and over again. One reason is that I receive a lot of requests for support via private channels such as PMs on the forums, contact form submissions, and e-mail. In an effort to reduce my support workload and encourage collaboration between customers and readers of the blog, I have slowly started to redirect support requests to the support forums. The forums help me help you. All posts on the forums are public, so other readers can participate in and benefit from the discussion. Moving forward, I will no longer be answering support requests via a private channel. If you send me an e-mail, contact form, or PM on the forums that is not of a specifically private nature, there’s a good chance I will respond with a form letter redirecting you to the support forums. This isn’t because I don’t want to help, but because I need to make the most effective use of the limited amount of time I have to provide support. Of course, this doesn’t mean that I won’t be responding to private communications at all – if you have something you would like to discuss that warrants a closed conversation, then by all means, send me a private message on the forums or submit a contact form. 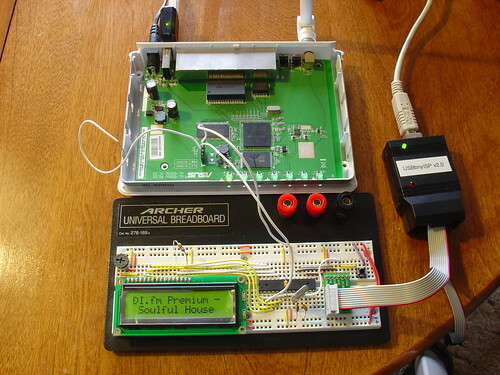 I’d also like to point out that product support gets top priority, so if you have a question about a project that doesn’t involve a kit (like the Wifi Radio project) and I don’t respond immediately, please bear with me – I’ll get to your request as soon as I can. The rain and dropping temperatures in San Francisco this weekend reminded me of a project I made in the winter of 2006. 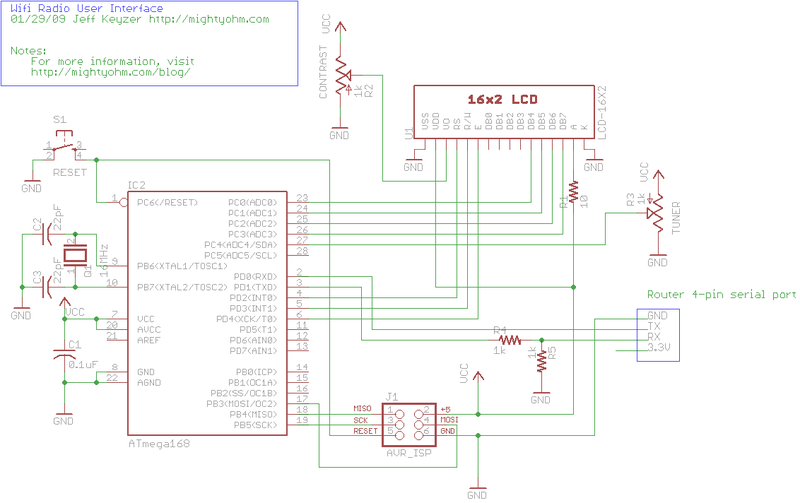 This was long before mightyohm.com existed, so I originally documented the project at instructables. I’m not going to repeat everything here, but I wanted to share some pictures and provide a link to the instructable in case anyone else wants to try this at home. 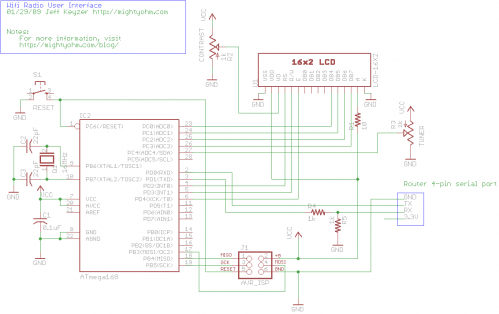 The project involves using a digital programmable thermostat to control an inexpensive space heater. 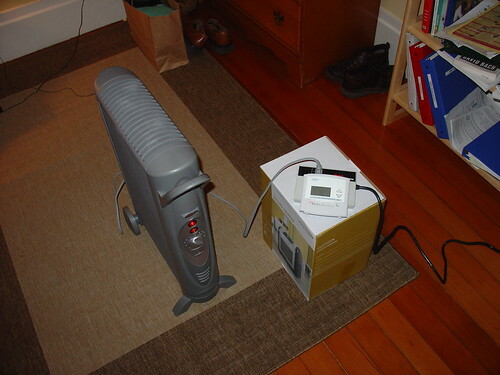 The original motivation for this was that I wanted to lower the temperature of the heater at night, reducing my energy bill, while still being able to wake up to a toasty room in the morning by setting the heater to turn on full blast 30 minutes before I awoke. 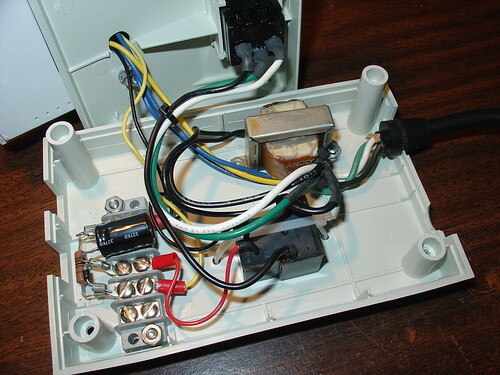 I installed the necessary components inside the case of an old power and telephone line filter, used to protect a fax machine or office copy machine from power surges. The case came with a handy 110V outlet mounted on the front panel which I reused for this project. 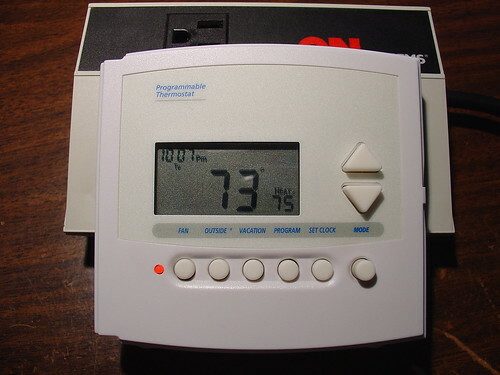 The digital thermostat mounts to the top cover of the case. I had to adjust the value of C1 to get reasonably clean DC to the relay while not having an annoying turn-off lag when the control line from the thermostat goes low. 100uF works well for the relay I used. I haven’t used it since I moved into a house with working central heating, but it sure came in handy during the cold winter I spent in a 100 year old farmhouse in Petaluma. This solved the problem of the sub-50 degree mornings I was having nicely! Comments? Questions? Leave a comment below! A little over a year ago, I became an Uncle. 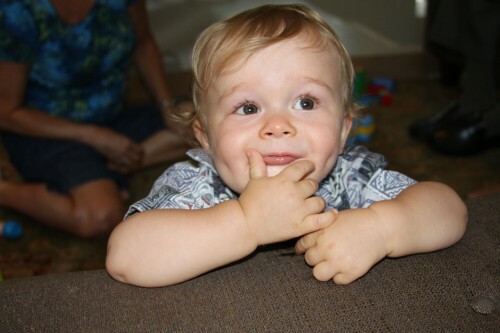 This is my nephew, Harrison, doing what he does best – being cute. For his first birthday, Harrison’s Mom wanted to give him something really special. 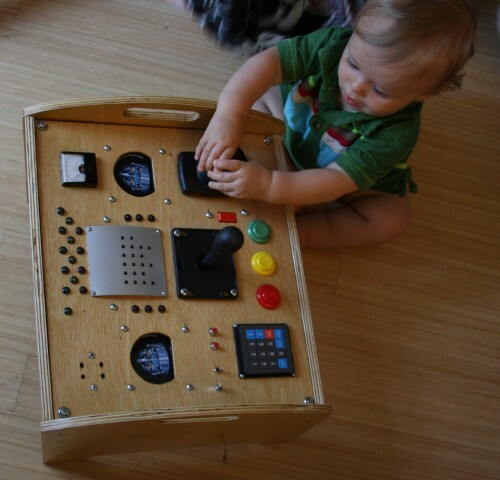 Not just an ordinary toy for a one year old, but something strange and wonderful, tactile, interactive, unique. 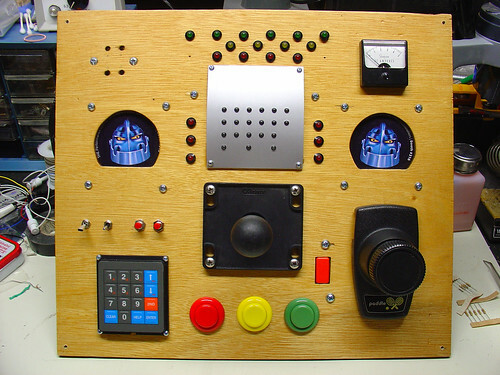 Thus was born the idea of an “electric box”, an electronic contraption full of switches, lights, buttons, knobs, levers, and sounds. An elite task force was assembled to create this special gift, codenamed “Harrison’s Box”. The team consisted of Grandpa, the Woodworker, Jeff (alias mightyohm) the Engineer, and Kylie, the Project Manager. Upon defining the project, we immediately jumped into phase one, Procrastination. Deliverables were met, and as the birthday loomed closer, we eased into phase two, Git ‘er’ Done. 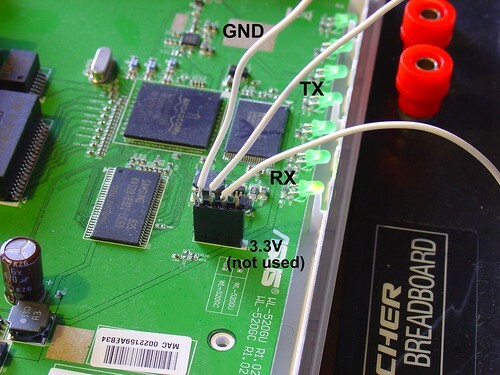 Almost all of the electronic components, including the arcade buttons and joystick, were sourced from All Electronics. A few odds and ends came from my junkbox. 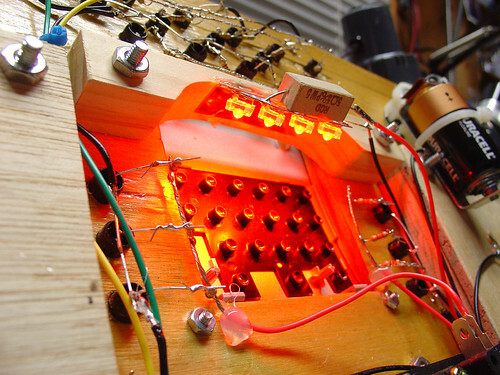 The wiring is point to point – zipties and hot glue keep all of the individual wires in place. 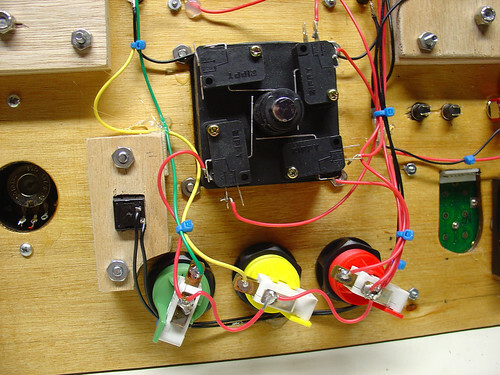 Here’s a shot of the wiring for the pushbuttons and the joystick. 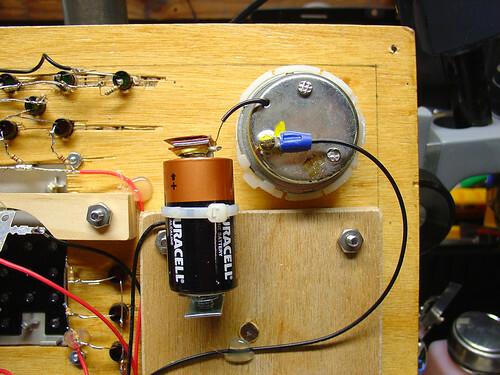 The buzzer consists of the guts of a cheap bicycle buzzer and a single C cell battery to power it. 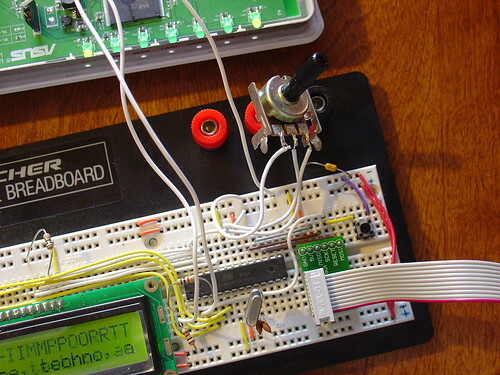 Some creative wiring allows a pushbutton elsewhere on the panel to control the buzzer. I salvaged a few high brightness red LEDs from a surplus automotive taillight assembly I picked up at Weird Stuff a few years ago. 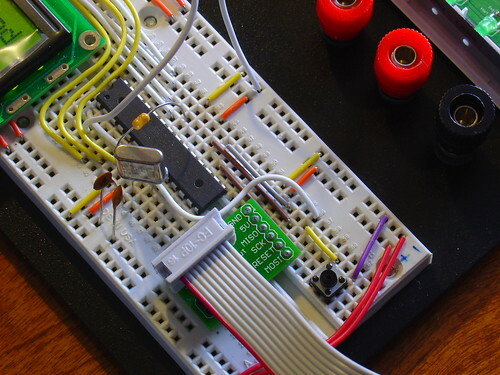 A 5 Watt power resistor I had in my junkbox limits the current to the LEDs to a bright but not blinding level. 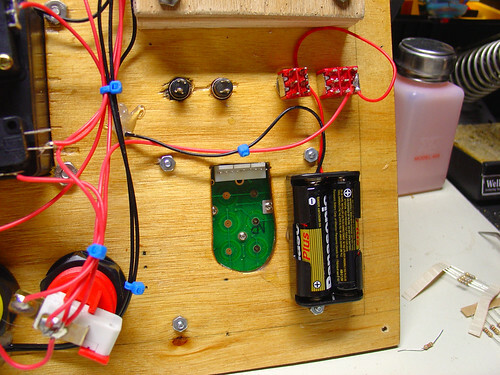 The whole box (with the exception of the buzzer, as noted above) is powered by a pair of AA batteries. Initially the Box was met with some skepticism. Perhaps Harrison was dwelling on the simple question: Toy or thermonuclear device? 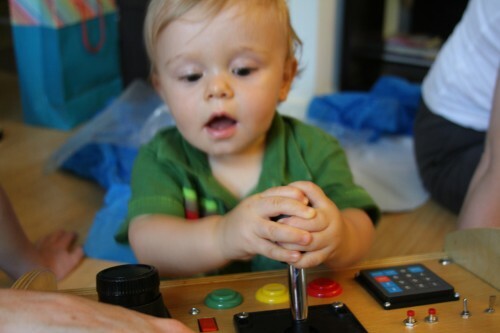 Understandably, there were very cautious button pushes at first. 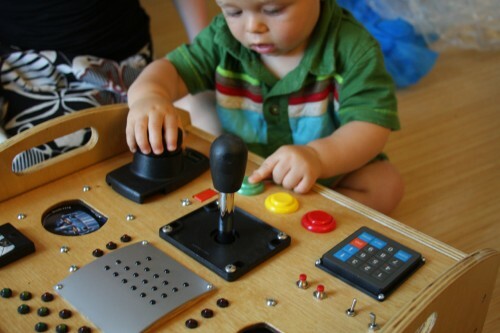 Moments later, knobs were being turned, switches switched, buttons pushed, and Harrison had learned how to use the joystick. Look out Steve Wiebe! The front panel mounts to a small stand that conceals and protects the wiring while also giving Harrison something to hold onto while operating the Box. 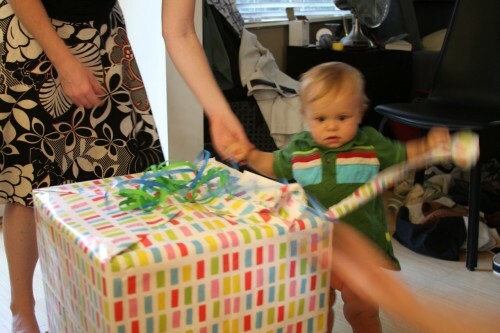 I’m happy to report that Harrison’s Box was a success. Check out more pictures of the box on flickr.